The White House, responding to critics, released an opinion Wednesday morning supporting the appointment of Matthew Whitaker to serve as acting attorney general. In a lengthy opinion, the Office of Legislative Counsel countered arguments that President Donald Trump's appointment of Whitaker violated federal law and the Constitution. These arguments are likely to get their day in court, as Whitaker's appointment has already been challenged in the legal system. Upon the resignation of Attorney General Jeff Sessions and acting under the auspices of the Federal Vacancy Reforms Act, Trump appointed Whitaker—Sessions's chief of staff—to serve as acting attorney general. Whitaker will serve as acting attorney general until a new AG has been nominated by Trump and confirmed by the Senate (or until a statutorily prescribed deadline passes). Whitaker has been openly critical of the ongoing investigation by former FBI Director Robert Mueller into Russian meddling in the 2016 election, so his appointment raised alarm in some corners. Sessions had previously recused himself from oversight of the investigation, due to his role as a proxy for Trump in the election, leaving Deputy Attorney General Rod Rosenstein in charge of it. Oversight authority now passes in principle to Whitaker—a role he is still considering whether or not to take up. These concerns were likely what prompted critics to ask a more fundamental question: Is Whitaker's appointment legal? The attorney general has an established second-in-command—in this case, Rosenstein—to whom responsibility perhaps ought to fall. More importantly, the Constitution stipulates that cabinet officials ("principal officers") need to be confirmed by the Senate. This is why, for example, Trump opted to appoint already-confirmed OMB Director Mick Mulvaney to fill the vacancy in the directorship of the CFPB created by the departure of Richard Cordray. 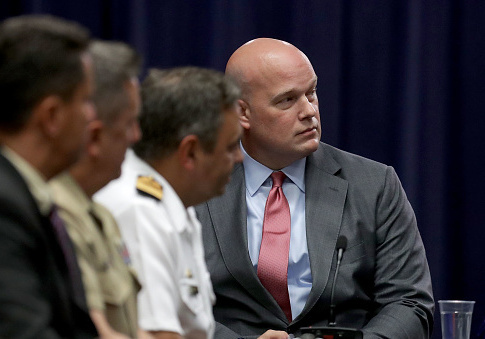 Former Acting Solicitor General Neal Katyal and prominent litigator George Conway argued in the New York Times that Whitaker was ineligible to serve as AAG under the terms of the appointments clause. The two cited a concurrence from Justice Clarence Thomas, arguing that the appointment of a principal officer—even in an acting capacity—without Senate confirmation raises "grave constitutional concerns" about violation of the appointments clause. That case concerned an acting counsel at the NLRB and, Katyal and Conway wrote, "what goes for a mere lawyer at the N.L.R.B. goes in spades for the attorney general of the United States, the head of the Justice Department and one of the most important people in the federal government." The State of Maryland, which was previously suing Sessions in his capacity as attorney general, has now asked the federal judge adjudicating its suit to determine who the attorney general is, legally speaking. Maryland cited the Appointments Clause, as well as pointing to the DOJ's organizing statute, which explicitly stipulates that the deputy attorney general "may exercise all the duties" of the attorney general's office if the latter is absent. The White House disagrees, outlining why in the 20-page OLC opinion. While 28 U.S.C. § 508 does say that the Deputy attorney general is permitted to exercise the powers of the attorney general in his absence, "that statute does not displace the President's authority to use the Vacancies Reform Act as an alternative," OLC argued. The argument that the president's hands are tied by statute did not hold when Cordray attempted to appoint his deputy, Leandra English, to replace him at CFPB, and it does not hold now. The FVRA instead explicitly authorizes three possible replacements for a principal officer: his "first assistant" (in the case of the attorney general, the deputy attorney general); another presidential appointee who was previously Senate-confirmed; or another officer or employee of the relevant agency provided that said person has been in the agency for at least 90 days in the past year, and is at a pay grade of GS-15 or above. Whitaker falls into this category, and so OLC believes him to be "unquestionably" qualified to replace Sessions. The OLC also addressed the deeper Appointments Clause argument, largely by recourse to history. They contend that an "acting" attorney general is not the same as an attorney general, and that consequently the former is not a "principal" officer for Constitutional purposes. (Katyal and Conway disagreed, claiming that "what makes an officer a principal officer is that he or she reports only to the president"). This they support by indicating that as far back as 1792, Congress made it clear that appointment of acting officers did not require Senate confirmation, a practice confirmed by 1892's U.S. v. Eaton. Whether or not OLC's arguments will hold up in court remain to be seen, but will likely be tested in Maryland's suit. That case could go as far as the Supreme Court—in which case Thomas's casual aside could prove pivotal in determining Whitaker, the Mueller investigation, and the DOJ's future. This entry was posted in Issues and tagged Department of Justice, White House. Bookmark the permalink.